Significant progress in understanding the pharmacological characteristics and physiological importance of homomeric and heteromeric P2X channels has been achieved in recent years. P2X channels, gated by ATP and most likely trimerically assembled from seven known P2X subunits, are present in a broad distribution of tissues and are thought to play an important role in a variety of physiological functions, including peripheral and central neuronal transmission, smooth muscle contraction, and inflammation. The known homomeric and heteromeric P2X channels can be distinguished from each other on the basis of pharmacological differences when expressed recombinantly in cell lines, but whether this pharmacological classification holds true in native cells and in vivo is less well-established. Nevertheless, several potent and selective P2X antagonists have been discovered in recent years and shown to be efficacious in various animal models including those for visceral organ function, chronic inflammatory and neuropathic pain, and inflammation. 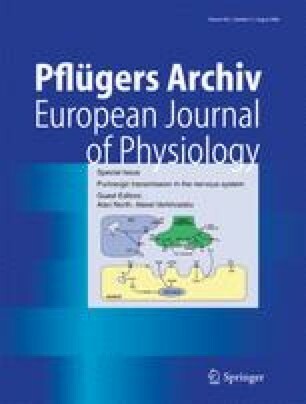 The recent advancement of drug candidates targeting P2X channels into human trials, confirms the medicinal exploitability of this novel target family and provides hope that safe and effective medicines for the treatment of disorders involving P2X channels may be identified in the near future.